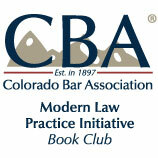 The Modern Law Practice Initiative has brought its Toolkit alive! Join us for our monthly gathering to discuss the CBA’s step-by-step guide of how to build a modern law practice, Successful Business Planning for the Modern Law Practice (available to CBA members for free). While each month will begin with a focus on a particular chapter of the Toolkit, the discussion will be open to general questions about how to successfully run a modern law practice. The book club meets the last Thursday of each month from 5:30-7:30 p.m. at the CBA. Join us for our next meeting on July 27 to discuss Chapter 4. Hope to see you there (though a call-in option will be available upon registration)!